After her glorious showing in the previous season, ‘Paula’ (Janeane Garofalo) only appeared in two measly episodes of the fifth instalment of The Larry Sanders Show (1996), prompting Garofalo to jump ship and join the cast of Saturday Night Live… where, according to what I’ve read, she didn’t fare much better in terms of screentime or optimum-talent-usage. On the upside, she does get two pretty strong episodes here, and still managed to snag a second Emmy nomination for “Outstanding Supporting Actress in a Comedy Series”, so yay for that. However, some compensation for the paucity of Paula was provided in ep #5.5, with the introduction of a new female staff-writer, played by none other than Sarah Silverman (whose official credit rather gratifyingly incorporated her “Big S” moniker!). Her character, ‘Wendy Traston’, was a perfect fit for the actress, as a charismatic joke-slinger whose gender was a major sticking-point for blindly chauvinistic head-writer ‘Phil’ (Wallace Langham), refusing to even read her contributions, let alone pass them on to Larry! Thankfully, Wendy ably proved that women can in fact be funny (both on the show, and behind the scenes), and she made a fantastically feisty foil for Phil… so it’s a real shame that this was her only appearance this time around (though I know she’ll return in the next season, for a couple more episodes… so that’s something for me to look forward to at least). Un-fun fact: Silverman had just completed her own inglorious stint as an under-utilised SNL cast-member a year before Garofalo signed-up… but apparently they didn’t get a chance to compare notes in time to save the latter some heartache! Meanwhile, Penny Johnson Jerald almost got a proper ‘Beverly’-centric storyline (and a love-interest) in ep #5.11, when she suspected a hunky network suit was sending her flowers and chocolates… but then the whole thing flamed-out (if you’ll pardon the expression), when proudly-Gay office-mate ‘Brian’ (Scott Thompson) admitted he was her supposed “secret admirer”. I’m not really sure if it was supposed to be a prank or a pity thing on his part… either way, it was a disappointing anti-climax to a subplot that could have run for at least a couple more episodes, imho. Oh, but she did volunteer to pass Wendy’s monologue jokes along to Larry behind Phil’s back, so she deserves to take a bow for that, if nothing else. As the saying goes: “Girls Compete With Each Other, Women Empower One Another”. Right on! 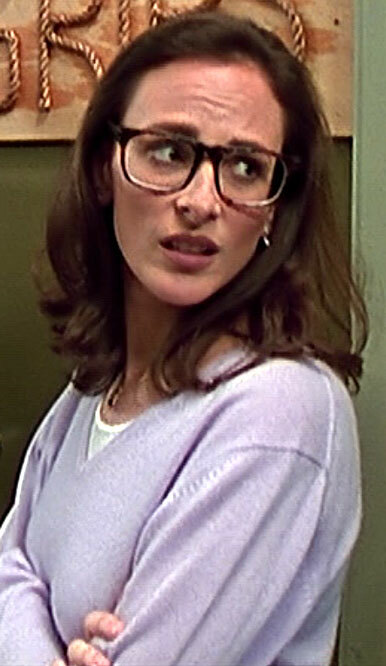 As for the guest-stars: Amy Aquino appeared in ep #5.2 as an attractive rabbi who inadvertently inflames ‘Hank’s (Jeffrey Tambor) religious fervour, and throws the staunchly-secular show into disarray. Sally Field appeared in ep #5.3, as her adorable self, guesting on the chat-show and trying to alleviate Larry’s fretting over his feud with a spiteful critic. At one point she started to reference her infamous (and much-mocked) Oscar acceptance speech, but was swiftly cut off by the self-involved chat-show host! Tch! Ellen DeGeneres made an Emmy-nominated appearance in #5.4 as “herself”, getting so ground down by the intense media speculation over her (at the time) ambiguous sexuality that she ends up acting-out by bedding Larry… who continues hounding her to “come out” on-air, just to boost his show’s ratings! Tch! Brooke Smith appeared in ep #5.7 as ‘Tonya Bailey’, a reporter for People magazine sent to cover a dying child’s visit to the studio, who scores all sorts of salacious scoops, just by hanging around backstage and keeping her notepad handy! Laura Leighton appeared in ep #5.8 as “herself”, dating Larry and demonstrating a similar level of narcissism, entranced by the sight of her own show (Melrose Place) playing on TV while they’re making out. Meanwhile, Artie was absorbed in a torrid, globe-trotting liaison with Angie Dickinson that temporarily robs him of all reason and responsibility! Lori Loughlin appeared in ep #5.9 as “herself”, guesting on the chat-show and stealing cash straight out of Larry’s wallet after he takes her back to his place for a cosier tête-à-tête! Harsh. Dana Delany returned for a third and final series cameo in ep #5.10, helping Larry to fact-check his autobiography by passive-aggressively correcting his recollection of their “relationship”. Later, Marlee Matlin and Brooke Shields end up trying to coax a brooding Larry out of the Grips’ room, after he reads the completed draft of his book, and becomes depressed about how awful and empty his life seems when it’s written down in black-in-white. Fun fact: Matlin was joined on-screen by her real-life sign-language interpreter Jack Jason, who’s been working with her since 1985… and apparently doesn’t mind turning the air blue on her sweary behalf! Oh, I also have to give a shout-out to David Duchovny for his very sporting appearance in the season opener (ep #5.1), where Larry begins to suspect that the actor might have a serious crush on him. The scene where Duchovny tried to explain his conflicted feelings for the chat-show host was a definite highlight of the series, and it’s easy to see why the episode was nominated for numerous awards, including an “Outstanding Guest Actor” Emmy for Duchovny. Hey, sometimes men can be funny too, amiright? * Presumably that’s why Paula never got around to firing her, allowing Mary Lou to recur throughout the season, scoring appearances in seven out of the thirteen episodes (#5.4/6-10/12), and replacing her former supervisor entirely in the subsequent season! This entry was posted in Rants about TV and tagged Amy Aquino, Angie Dickinson, Beverly Barnes, Brooke Shields, Brooke Smith, Dana Delany, Ellen DeGeneres, Janeane Garofalo, Laura Leighton, Lori Loughlin, Marlee Matlin, Mary Lou Collins, Mary Lynn Rajskub, Melinda McGraw, Penny Johnson Jerald, Sally Field, Sarah Silverman, The Larry Sanders Show, Wendy Traston. Bookmark the permalink. 1 Response to Applesauce 5: Paula’s Last Hurrah!